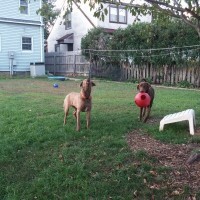 Living with two dogs that suffer from anxiety, one who is also extremely noise sensitive, I decided it would be best to have them spend the roofing days at daycare. Radar, the blind dog, I would just keep with me as noise doesn’t bother him as much and he travels well. I had purchased all of the shingles and tar paper for my detached garage roof a week prior to the roofing job and had them stored in my garage. The dogs, mostly Radar have been walking past them daily with no incident. On the first day of roofing Louie and Yukon went to daycare in the morning and Radar spent the day driving around with my Dad and I as we got estimates to fix his car. We then drove an hour or so north to meet my Mom so they could return home. Radar was with me all day. Radar and I returned home and we went into the backyard to see how the roofing was progressing. Radar started barking which did not alarm me much as the roofer was in the yard and Radar had not met him. Even after Radar met him, he continued barking. Some plastic was flying around so I thought that was the problem. I collected it and tried to show it him and he ran away barking. 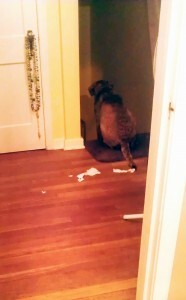 As I observed Radar’s reactions, I realized the problem. He was smelling the new shingles and that strong smell was new and stronger/quite different from the smell of the 20+ year old shingles. Radar’s perspective of his backyard had completely changed. It was no longer familiar and he was feeling lost. The yard was only safe up next to the house, as far away from the new shingles on the garage as possible. 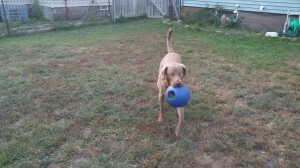 I first tried to get him to play with his favorite toy in the section of yard near the house. He wasn’t interested. I then tried to walk the yard with him at my side but as soon as we hit the back half of the yard, Radar’s brakes went on and he wasn’t going to take another step. I then tried walking the yard’s perimeter talking the whole time so he could hear that it was the same. Nope, he just barked and acted like there was a solid wall in the middle of the yard. 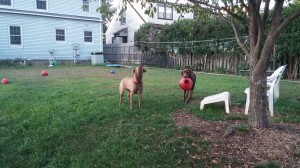 I decided I needed backup so I put Radar in the house and went to pickup Louie and Yukon. Radar barking at the garage/shingle odor. 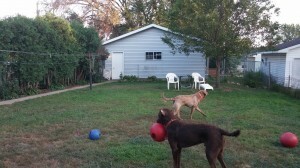 Louie, Yukon, Radar and I all went into the backyard and Radar’s barking started again. Louie investigated the obvious new smells of the roofers which coincided with his favorite mouse hunting area! 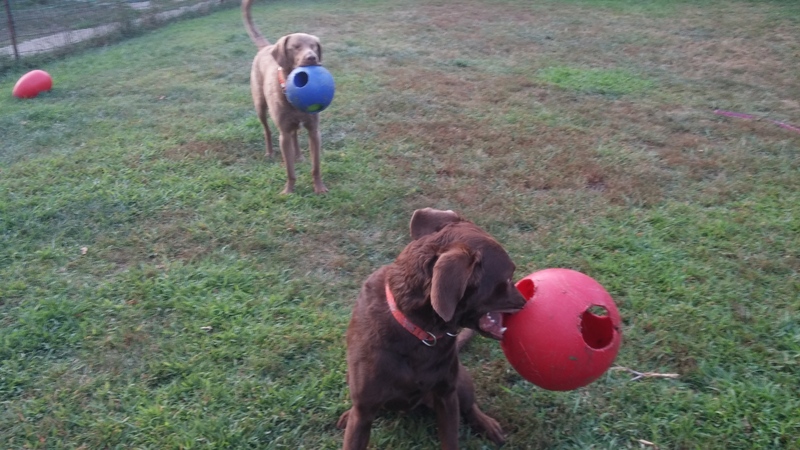 Yukon played with his ball and Radar barked. Radar finds comfort from his housemates. If they are okay with the changes, it can’t be too bad. We spent about 45 minutes playing in the yard. 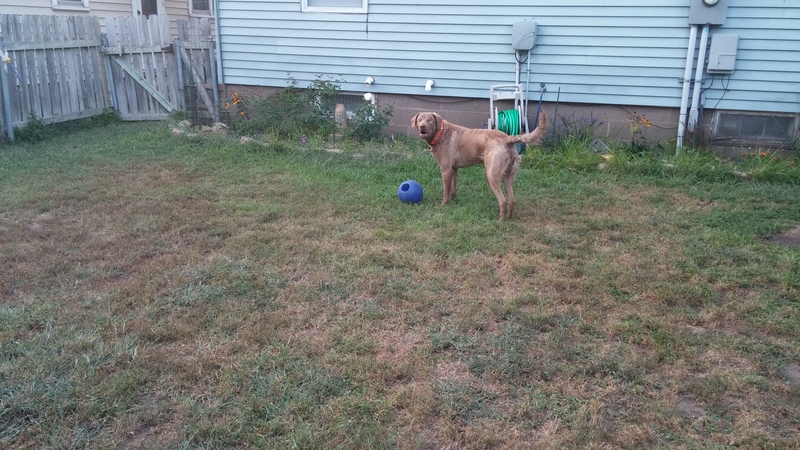 Radar finally decided to play fetch in the “safe” part of the yard and eventually did venture into the “new/different” area. He did his high, overly cautious “what in the hell do you want me to go here for” stepping. He was willing to walk back there a bit with all of us but not for long and he barked his protest. 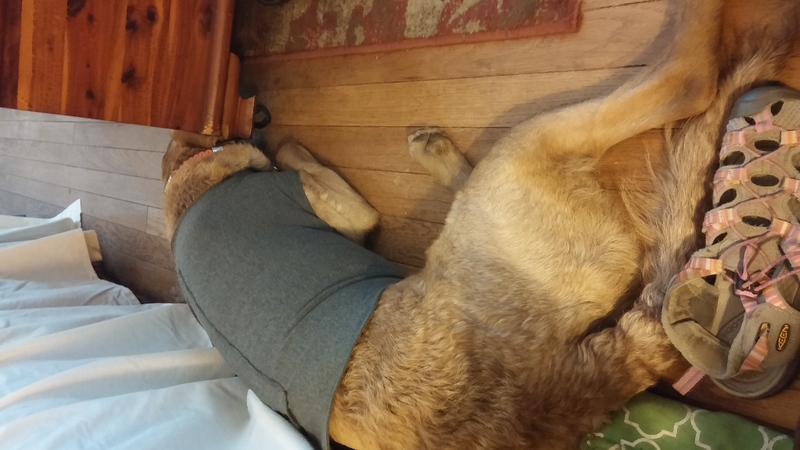 Thundershirt helps to calm Radar when his home environment has been turned upside down. After coming in the house, Radar was still anxious and barking so I broke out the Thundershirt hoping to avert any more stress and possibly a seizure. Thankfully the Thundershirt worked its magic and Radar calmed down and took a nap. That evening Radar had a hard time settling down. He would not pee or poop in the backyard so we had to use the front yard and walks for taking care of business. Even in the middle of the night, we had to walk around the neighborhood to go potty. Radar has had two stress induced seizures so I was afraid he would suffer another the first night. I used the Thundershirt and several acupressure points I have learned from my holistic vet (Vet-Energy, Dr. Jan Schilling) to try and avert a seizure. Night one was seizure free however Radar acted very disoriented and restless most of the night. 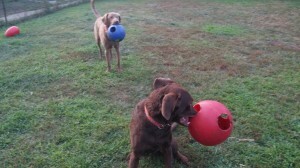 On day 2 of the roofing, Louie and Yukon again went to daycare and Radar stayed home. After the air hammering was done, we went outside as they finished. Radar was again fearful and barking in my yard. 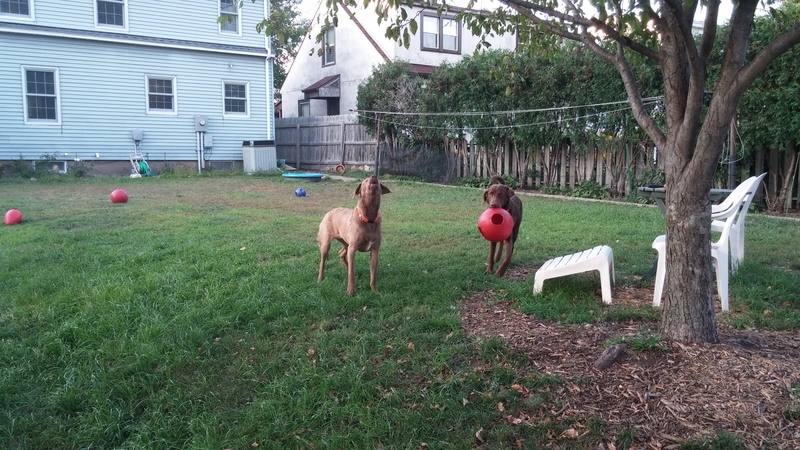 My neighbor was out in his yard watching so Radar and I went over to his yard. Radar has not been in my neighbor’s yard much but he was visibly more comfortable over there. 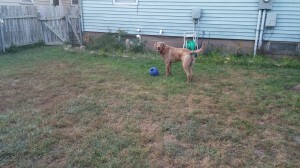 He explored the yard for an hour while we sat there watching the work finish on my garage. Radar would not come too close to us but preferred to do his own thing and keep his distance. When I did return to my yard after the work was complete Radar came but stayed near the house. He still barked a bit but not as much. The petroleum/shingle odor was noticeably less in the less than 24 hours that most of the shingles had been on the roof. The day was also overcast on Day 2 rather than the sunny day on Day 1. I suspect the sun beating on the shingles made them warmer and produced more odor as well. 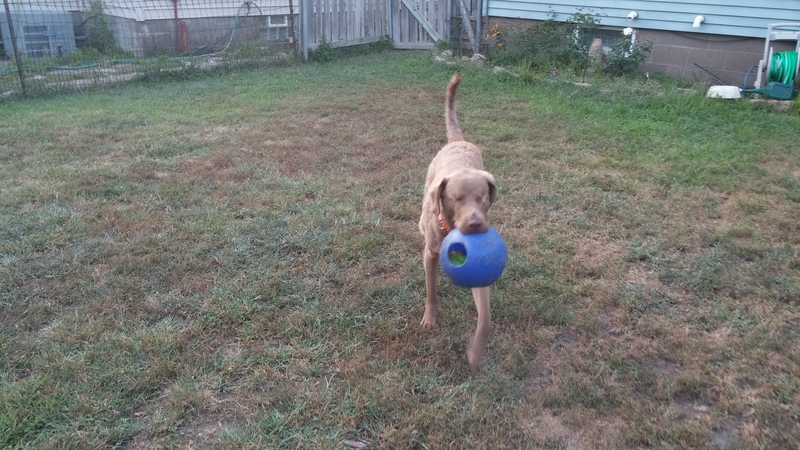 Playing fetch with his favorite ball is a good distraction/confidence builder. Radar continued to be very skeptical and nervous in the backyard for several days after the new roof was installed on the garage. The odor did not always appear to be evident to him but if he caught a whiff of it he would immediately start barking and retreat towards the house. Toys and the other dogs helped to distract him. I will make sure that Radar is present for the work as much as possible without stressing him out. I think if he had been exposed to the new odor of the shingles more gradually, he would have adapted. Somehow I need to expose him to changes in his immediate environment (i.e. yard and home) and work on a signal or process to maintain his confidence in accepting and adapting to the change. I suspect this will have to be a long term project and hope as he ages, he becomes more “bomb proof”. Continue the work I am doing to expose him to different environments and situations making them good experiences using counterconditioning.